For regular WordPress users, creating a post in WordPress is a fairly easy process. However for those just starting out, there are still things that they might find confusing. While the featured images functionality is a total life saver, it requires some basic understanding of WordPress to properly use it. Recently one of our readers reached out to us with a problem that their featured image was displaying twice. It is a fairly common image problem that can easily be solved. In this article, we will show you how to fix featured images appearing twice in WordPress posts. Why Featured Image is appearing Twice in my WordPress Posts? The most common reason for a featured image or post thumbnail to appear twice in WordPress posts is that sometimes beginners set a featured image and also insert it into the post content. This actually makes sense to most beginners because when they set a featured image, they expect it to appear in their visual post editor. When it does not appear in the visual post editor, they feel that they may have missed something and end up inserting the same image again in the post. This time they can see it in the visual post editor and feel satisfied. But when they publish the post, they notice that the image is appearing twice on their post. Just remove the image from the post editor and make sure you use the featured image box to set your featured image. Featured images or post thumbnails are a WordPress theme feature. This means that the support for this feature is handled by your WordPress theme which is why you don’t see how it looks in your post editor. When you set a featured image for a post, the database communicates with your theme that there is a featured image that can be displayed automatically. This allows theme developers to use consistent styles for post thumbnails and featured images through out your website. 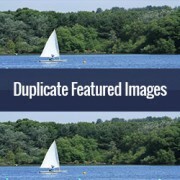 While this may fix the duplicate featured image issue for most users, you may also come across some other surprising issues. For example if you change the theme, then your featured images may look stretched, skewed, and disproportionate. To fix this you will need to regenerate image sizes in WordPress. If the above solution does not help fix the problem of featured images appearing twice, then there is an issue with the underlying code of your theme. In this case, the best solution is to contact your theme developer for help. Check out the solution for other common image issues in WordPress. We hope this article helped you fix featured images appearing twice in your WordPress posts. For questions and feedback, feel free to leave us a comment below. You can also reach out to us on Twitter and Google+. I have just migrated from blogger so there are several posts. Removing post images and adding to featured images would be time-consuming. Can I do it all at once? if both images are different means the media and feature image so what to do? Thank you!! Double pics were driving me nutty! You’re the best! Hey thanks man! This post really helped me out as I was getting duplicate images after changing my theme! This worked for my site, which runs on the Divi Elegant template. I wish there was a way to do this for all my posts though, instead of having to go manually and delete the images from the posts. I deleted the image in the article and left it as the Featured Image (more than once) and now it does not show in the article at all? You can give credit in your post. I’ve just taken over a blog & WP is driving me insane. I have an issue similar to this but not quite the same. If I delete the second image (so I now only see the featured image once and it’s not repeated) how do I get the 1st paragraph of copy to appear above the image, not below it? Your theme displays featured image before the content or next to it. If you want to display an image after the first paragraph then you need to add it as a normal image instead of featured image. I had the same problem, but when I do what you said, I don’t have a thumbnail show for prior posts. Thank you SO much for this info!!! I have been searching forever!!! It works for me however when I open the post the image is left aligned and all the other images are centered. How do I set the featured image to centered once I open the post? Your WordPress theme handles how featured images are displayed on your website. You can use CSS in your child theme to adjust image alignment. Did you find the solution for image alignment? 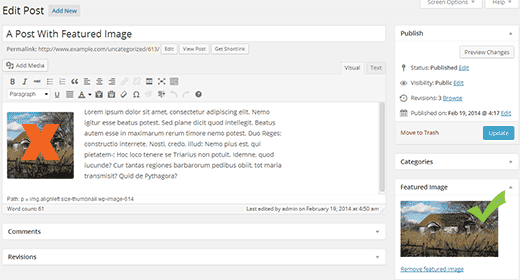 I have a self-hosted WordPress blog running the Sela theme. I have set in my pages a featured image. Yesterday I changed the page to full width page in page attributes. When I check my featured image in page preview it appears. When I visit my site the featured images do not appear at all. Please contact your theme developer for support. My issue is different. I normally get a text code from the licensor of the photo and I insert the text onto the body of the post and the photo will show normally. Now, I want to know how can I use the same photo as featured image? Because the photo won’t show unless you open the article and see it. And If I select the featured image option, then two photos will show. The one that I put in the body with the text code and the one as a featured image. This works but what if I don’t want a thumbnail image in my post? What If in the post I want a full sized image? The other issue I have is that sometime I con’t want the lead image in my post to be the same image as the thumbnail used other places. I have been looking everywhere for a solution to this and this simple step have solved my problem. Thanks so much! Yes this article does not help you with that. Featured images are a theme feature, usually when it is added to a theme it becomes available to all posts by default. Disabling support for featured images in the theme will disable them on all future post as well. On the other hand you can avoid altering your theme and keep using featured images. For your past posts you can display a generic default fallback image, or you can display a fallback image based on post category. Some themes have the option to display a featured image in your posts; some don’t. So for someone like me, who switched from a theme that didn’t support them, to one that by default automatically does, I’m looking for a way to disable them in all past posts in this new theme. This article does not help with that. Just found this post and it really was an eye opener. I have changed my post accordingly and understand now why I was getting the double images. The other issue I’m having is that I just changed my theme and now my featured images are not showing when publicized to FB. Trying to figure out what happened. Do you have any advice for fixing this issue? I am fresh beginner in wordpress. But when i have a big blog and now i will change to show feature images directly in theme? Any function to automaticly delete the first picture in all posts? In WP, it used to be you could designate a picture within a post as the featured image. This did not produce a duplication of the image (usually now top right thumbnail) on the blog post. With one of the upgrades (not too long ago), I started having problems with any imagine showing up when posting to FB, Google+ et. al. without a second step declaring a feature image. Often I only have one image in a post. Is there any way to designate a feature image for sharing without having it show up as a thumbnail on the blog post (but instead, later as a larger imagine within the blog text)? I’m using the Headway theme, by the way, but don’t imagine that matters. Thanks for any help you can provide! You can use the first attachment in your post as the post thumbnail or featured image. Check out our guide on how to set a default featured image, particularly the second section ‘Adding the First Post Image as the Default Fallback’ might be helpful. Thank you! You answered my question before I had to go searching for it. Very helpful.